This article is about the 1984 comic book series. For the 2015 series, see Secret Wars (2015 comic book). For the 2004 series, see Secret War (comics). For other uses, see Secret Wars (disambiguation). Marvel Super-Heroes Secret Wars #1 (May 1984). Cover art by Mike Zeck. Kenner had licensed the DC Heroes, and Mattel had He-Man, but wanted to hedge in case superheroes became the next big fad. They were interested in Marvel's characters, but only if we staged a publishing event that would get a lot of attention, and they could build a theme around. Fans, especially young fans often suggested to me "one big story with all the heroes and all the villains in it," so I proposed that. It flew. Mattel thought that kids responded well to the word "secret," so after a couple of working names bit the dust, we called the story "Marvel Super Heroes Secret Wars." In the eleventh issue of the Marvel Age news magazine, published February 1984, a news column announced the series as Cosmic Champions. One month later, the twelfth issue of Marvel Age featured a cover story on the series, now titled Secret Wars. We went through a number of ideas for names for the toy line and series. Mattel's focus group tests indicated that kids reacted positively to the words 'wars' and 'secret'. Okay. Mattel had a number of other requirements. Doctor Doom, they said, looked too medieval. His armor would have to be made more high-tech. So would Iron Man’s, because their focus groups indicated that kids reacted positively...etc. Okay. A cosmic entity called the Beyonder observes the mainstream Marvel universe. Fascinated by the presence of superheroes on Earth and their potential, this entity chooses a group of both heroes and supervillains and teleports characters against their will to "Battleworld," a planet created by the Beyonder in a distant galaxy. This world has also been stocked with alien weapons and technology. The Beyonder then declares: "I am from beyond! Slay your enemies and all that you desire shall be yours! Nothing you dream of is impossible for me to accomplish!" The heroes include the Avengers (Captain America, Captain Marvel, Hawkeye, Iron Man, She-Hulk, Thor, the Wasp); three members of the Fantastic Four (Human Torch, Mister Fantastic and Thing); solo heroes Spider-Man, Spider-Woman and the Hulk; and the mutant team X-Men (Colossus, Cyclops, Nightcrawler, Professor X, Rogue, Storm, Wolverine, and Lockheed the Dragon). Magneto is featured as a hero, but immediately becomes non-aligned when the Avengers question his presence. In 2015 Deadpool's Secret Secret Wars revealed that Deadpool was also a chosen hero, but the Wasp accidentally caused the other characters to forget his involvement. The villains include the Absorbing Man, Doctor Doom, Doctor Octopus, the Enchantress, Kang the Conqueror, Klaw, the Lizard, Molecule Man, Titania, Ultron, Volcana, and the Wrecking Crew. The cosmic entity Galactus also appears as a villain who immediately becomes a non-aligned entity. The heroes (the X-Men choose to remain a separate unit) and villains have several skirmishes. There are several significant developments in the series: villainesses Titania and Volcana are created; the second Spider-Woman, Julia Carpenter, is introduced; Spider-Man finds and wears the black costume for the first time, initially unaware that it is actually an alien symbiote (the symbiote would subsequently bond with journalist Eddie Brock, giving birth to the villain known as Venom); Doctor Doom temporarily steals the Beyonder's power; having fallen in love with the alien healer Zsaji (who sacrifices her life on Battleworld to save the heroes), mutant Colossus ends his romantic relationship with a heartbroken Kitty Pryde; and the Thing chooses to remain behind on Battleworld and explores the galaxy for a year, with She-Hulk temporarily joining the Fantastic Four as his replacement. The next issues of series tie-ins with Secret Wars open right after the return of the Marvel combatants. Immediate developments include: Thing replaced by She-Hulk in the FF, Spider-Man has a new costume, and Hulk has an injured leg and the savage side is re-emerging (to culminate in a totally animalistic, inarticulate Hulk in #299–300). Readers would have to read Secret Wars through to find what caused these changes. Years later, it was revealed that—while the heroes and villains fought on Battleworld—the Thing's girlfriend Alicia Masters was replaced by Lyja, a Skrull spy. When the Fantastic Four returned to Earth without the Thing, she began a relationship with the Human Torch. The two eventually married and remained a happy couple until the Skrull's true identity was exposed by the Thing and the Puppet Master. In 2011, IGN listed Secret Wars as one of the best comic book events. Their writers found the action and goofiness of the story to be enjoyable. They also highlighted the impact it had on the Marvel Universe by introducing the symbiote and new characters. In 2011, Alex Zalben of MTV News ranked Secret Wars as the second biggest comic event ever; he praised its story and lasting effect. 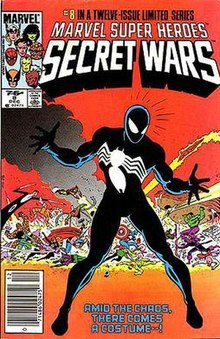 One year later, Secret Wars II was published, with the Beyonder visiting Earth and having a tie-in with almost every Marvel comic book written at the time. Marvel also published a third Secret Wars tale written by Steve Englehart and drawn by Keith Pollard within two issues of the Fantastic Four series (the "Secret Wars III" story in Fantastic Four #318–319 (September–October 1988)). In 2010, a Marvel Adventures all-ages non-canonical miniseries titled Spider-Man & the Secret Wars was released. It tells the story from Spider-Man's perspective and features major discrepancies with the original event. These tales include him receiving the Beyonder's power and creating "New Parker City", Spider-Man and the Thing spying on Dr. Doom, and a story featuring Spider-Man's suspicions concerning the Hulk. It was released in conjunction with Avengers & The Infinity Gauntlet and Captain America & The Korvac Saga, similar self-contained, all-ages re-imaginations of past events, that appear to take place in their own separate continuities in the standard "Marvel Adventures" manner. In 2015, as part of the modern day Secret Wars event, Deadpool's Secret Secret Wars was released. This four-issue miniseries retold the events of the original miniseries from Deadpool's point of view and fixed inconsistencies with the original and later events. Among these was the Wasp and Magneto's sudden one-night stand, and the purpose of the Secret Shields from the original toyline. It was ultimately revealed that the Wasp, out of either disgust or regret for seeing Deadpool's cancer-ridden body, accidentally caused everyone to forget his involvement in the storyline, creating the inconsistencies. "Brave New World" by Jay Faerber and Gregg Schigiel explored what would happen if the heroes became stranded on Battleworld, after Galactus and Beyonder destroy each other in battle. The battle continues for a while, but after the deaths of Bulldozer, Captain Marvel, Cyclops, Doctor Octopus, Kang, Magneto, and Spider-Woman, both sides declare peace. Hulk heads into the wilderness to find a way to get everyone back home, while Doctor Doom builds a replica of his Latverian castle. The Enchantress disappears, Mister Fantastic somehow dies, and Spider-Man's black suit causes him to turn cold and accelerates his aging to the point of becoming a skeleton. Eventually, some of the inhabitants have children who inherit some of their powers, including Bravado, Chokehold, Crusader, Firefly, Gator, Malefactor, Moleculon, Mustang, Raze, and Torrent. By Bravado's 18th birthday, Malefactor disposes of his father and gathers Chokehold, Gator, Klaw, Moleculon, and Raze in a plot to take over Battleworld. Bravado, Crusader, Firefly, Mustang, Torrent, and the heroes and reformed villains defeat them. Hulk and Doctor Doom (who faked his death when Malefactor attacked him) return to help end the conflict. Hulk has used 30th Century technology from the deceased Kang to create a portal that will take everyone home with the help of Thor's hammer. Uatu soon appears and warns them of the bad thing that will happen if they return to Earth. Though the adults call off the trip, the younger heroes sneak out at night and end up on Earth which is overrun with Sentinels. The five agree to stay on Earth as the Avengers and liberate Earth. On a related note, these five had appeared in the Destiny War storyline. In another alternate universe, Doctor Doom retains the Beyonder's power and takes over the universe. In May 2015 Marvel published a new Secret Wars mini-series, written by Jonathan Hickman and drawn by Esad Ribić, that picked up from where the "Time Runs Out" storyline running in Avengers and New Avengers at the time ended. The storyline involved the Marvel Universe combining with other alternate universes, including the Ultimate Universe, as well as the 2099 Universe, to form Battleworld, a world which exhibits aspects of the various universes. The core limited series was nine issues long, and ran for eight months, ending in January 2016. One of the core miniseries, Ultimate End, had ended the Ultimate Marvel imprint after 15 years at the time. Ultimate End is written by Brian Michael Bendis and artist Mark Bagley, the team that began the Ultimate Marvel universe with Ultimate Spider-Man. An abbreviated form of the 1990s "Secret Wars" storyline appeared in the animated television series Spider-Man, in which the Beyonder and Madame Web selected Spider-Man to lead a team of heroes (consisting of himself, the Fantastic Four, Captain America, Black Cat, Iron Man and Storm) against the villains Doctor Doom, Doctor Octopus, Lizard (who later switched sides), Alistair Smythe, and Red Skull. The goal was to allegedly determine whether good or evil was stronger. But, it was revealed after the war that the real goal was to determine which of several alternate Spider-Men was worthy to lead a team to save the universe. One completely written chapter of "Secret Wars" involved Spider-Man finding another black suit and the X-Men, but transporting the X-Men cast to L.A. (where production for the Spider-Man animated series was based) from Canada (where the X-Men animated series was based) was too costly in the previous episodes the X-Men appeared in, so the episode was dropped and only Storm was used for the rest of the chapters of Secret Wars due to the fact that Iona Morris (who was the first voice of Storm) lives in L.A. Hulk and She-Hulk were not used in these episodes because the Hulk show was on UPN. Furthermore, Quinton Flynn was the only voice actor to reprise his role from the Fantastic Four animated series. Mattel released three waves of action figures, vehicles, and accessories in the Secret Wars toyline from 1984 to 1985. In April 2019, the Russo Brothers reaffirmed that if they were to direct another film set within the Marvel Cinematic Universe following the release of Avengers: Endgame, it would likely revolve around the general events and storyline of "Secret Wars". ^ Shooter, Jim (April 4, 2011). "Secrets of the Secret Wars". www.jimshooter.com. ^ The kidnapping and replacement of Alicia Masters occurred between the events of The Thing #10 and Fantastic Four #265 (April 1984). ^ Esposito, Joey; Schedeen, Jesse; Norris, Erik; Perez, Migurel (30 May 2011). "The Best Comic Book Events". IGN. p. 2. Retrieved 29 April 2017. ^ Zalben, Alex (10 March 2011). "The 11 Biggest Comic Book Events – Ever". MTV News. Retrieved 29 April 2017. ^ Schedeen, Jesse (January 21, 2015). "A History of Marvel's Secret Wars". IGN. Retrieved April 29, 2017. ^ Clevinger, Brian (April 16, 2010). "Avengers Vs The Infinity Gauntlet Once More". IGN. ^ "Marvel Unveils 'Battleworld' Map Ahead of 2015's 'Secret Wars'". The Hollywood Reporter. 2014-11-25. Retrieved 2015-01-23. ^ "New Brevoort Formspring – I've been hearing different things about the". Brevoortformspring.tumblr.com. 2014-12-26. Retrieved 2015-01-23. ^ "Marvel Adds Extra Issue to Secret Wars". Newsarama.com. 2015-08-26. Retrieved 2015-08-27. ^ a b "Interview with John Semper". wariocompany. Archived from the original on 2010-02-20. Retrieved 2009-12-13. ^ a b c "Secret Wars, Part 1: Arrival". wariocompany. Archived from the original on 2006-08-22. Retrieved 2009-12-13.